Online Registration confirmation is the responsibility of each participant or the teacher/coach/parent completing the registration. After entering all personal information, you must click on PROCEED TO STEP 2 for payment. Clicking on SAVE & COMPLETE LATER will not register participants for the event. Athletes successfully registered for the meet will have THEIR NAME APPEAR IMMEDIATELY ON THE CONFIRMATION LIST. New Race Number: Organizers issue New Bib numbers for each meet. Do not use previously issued race numbers. Waiver Information: Waiver Form (HTML or PDF). This form should ONLY be used by teachers sending meet information to parents/guardians. School representatives must keep all paper waivers. School representatives must check the &apos;Waiver&apos; box during the electronic registration on Trackie; Waivers will include photo and event results publishing rights. Online Registration for Meet #3 is now closed! Please DO NOT use PayPal or E-checks as a form of online payment. NLAA has had issues with online registration in the past couple of weeks due to PayPal and E-Checks when registering children online. Please be advised that it may take 6-8 business days to process the payment. Event registration is not complete until the payment is processed and received. Therefore, when we download the information after the online registration has closed, we will have no record of that child being registered, and will not have a bib for him/her on race day. We would like to avoid this occurrence, to make the meet less stressful on everyone. An eCheck is an electronic funds transfer from your bank account to another customer’s PayPal account. It is used to fund a payment that is sent from your PayPal account. It usually takes up to 6-8 business days for an eCheck to clear and the money to appear in the recipient's PayPal account. All fees are Non-Transferable and Non-Refundable. No Credits. No refunds will be issued for duplicate registrations. Bib number pick-up: On-site, race day, at registration desk after 8:30 am! Runners will not be allowed to take part in the race without a number. Who can register me online? - Individual athletes and parents can register online as well as school coaches or designates can register the entire team up to 25 athletes in one transaction (teams with more than 25 athletes can do multiple transactions). Before you begin the online registration process, please make sure you have ALL required information for each athlete: Full Name, School, Gender, Date of Birth and event. During the registration process you can enter your School Code or NLAA individual membership # under "Member ID:" to avoid the extra $1 Day Permit Fee charge - NO REFUNDS/NO CREDITS if you miss to enter your school code or member ID. Eligible schools can follow this link to find out their School Code . PLEASE NOTE THAT ONLY SCHOOLS CURRENTLY AFFILIATED WITH THE NLAA ARE ELIGIBLE; STUDENTS FROM NON-AFFILIATED SCHOOLS MUST NOT ENTER THE SCHOOL CODES TO CLAIM DISCOUNT. Thursday 4:30 PM to 5:00 PM (before each meet) please bring exact change: You can also drop in at the NLAA office in Paradise to register for the meet. Please bring fully completed forms with EXACT payment (we have no change on site). Use the Individual Registration Form only when you register in-person. DO NOT USE THIS FORM IF YOU HAVE ALREADY REGISTERED ONLINE! The Meet Registration Form below is designated to be printed and used for the IN-PERSON REGISTRATION ONLY. The fee per athlete is $11.00 ($10.00). - Race numbers will be available for pick up AFTER 8:30 AM on race day at the race registration desk. Participants MUST ARRIVE and PICK UP THEIR RACE NUMBER AT LEAST 30 minutes before the scheduled start of their race. - In-person - cash, cheque or money order; If paying cash, you must bring exact amount as any change will be kept as DONATION for the Canada Games Track & Field Program. - All fees are Non-Transferable and Non-Refundable. No Credits. No refunds will be issued for duplicate registrations. NLAA strongly recommends that all coaches/team/club leaders set up and maintain "Coaches & Athletes" account on Trackie. Benefits - Coaches can enter athletes’ information online before meet registration opens. Once this information is entered, it stays available for all future meets - cross-country - track and field - TrackFest. To register your athlete(s) for a meet, first, coaches must sign into their account, then follow the meet registration link. 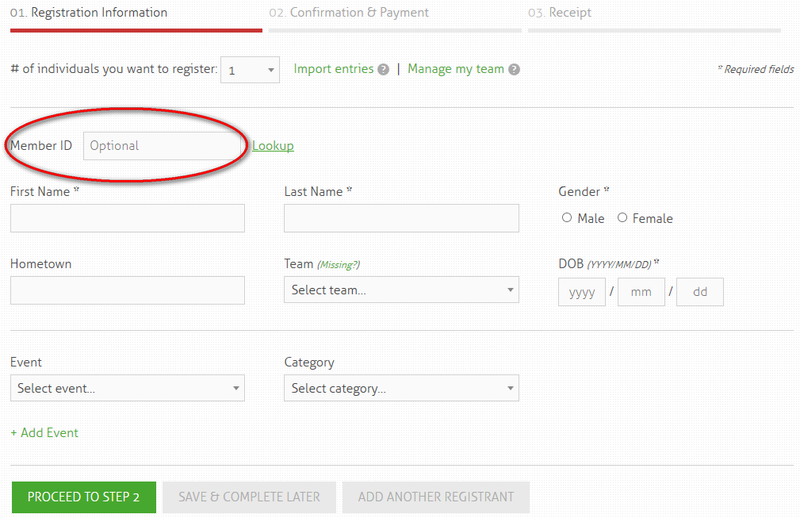 The "Team List" button becomes available to select your athletes. Please enter them in the desired event(s) before completing the registration process.